Long before the first white settlers arrived here, this area at the junction of the Smoky Hill and the Republican Rivers was a choice location to the Indians. The Kansa (Kaw) tribe of Indians lived in a village here as noted by explorers with the Lewis and Clark Expedition. The Osage, Pawnee, and Wichita tribes also inhabited this part of the state. All of these Indians hunted buffalo and were farmers, raising corn, beans, and squash to live on. The nomadic tribes (Cheyenne, Comanche, Kiowa, and Arapaho) roamed the plains to the west and also were occasionally found here. Photograph by A. P.Trott, ca. 1860s. Thought to be from the Kaw Tribe which lived along Lyon's Creek. 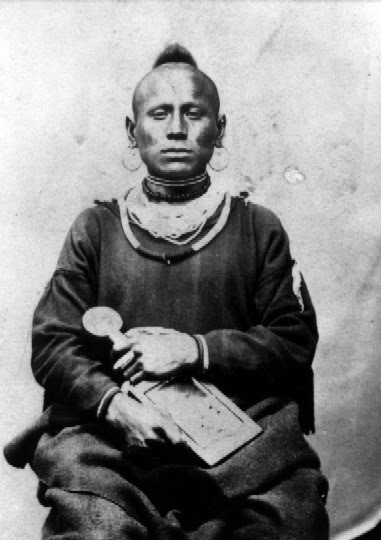 Chief Washunga of the Kaw Tribe was the last great chief to live in the Junction City area. The Chief Washunga photograph (on display in the Geary County Museum) and the one seen here were taken on Washington Street in Junction City by A.P. Trott, an early photographer, probably in the 1860’s or early 1870’s. An extensive collection of items donated by a society member, is on display at the museum. Kansas and Nebraska Territories were organized by the Kansas - Nebraska Act, which was passed by Congress and signed by President Franklin Pierce on May 30, 1854. The boundaries of Kansas were established on the east at the Missouri line, on the north at the 40th Parallel, on the south at the 37th Parallel, and on the west at the "summit" of the Rocky Mountains. surveys for the Rocky Mountains were so incomplete that the actual location and direction of the "summit" was not definitely determined. 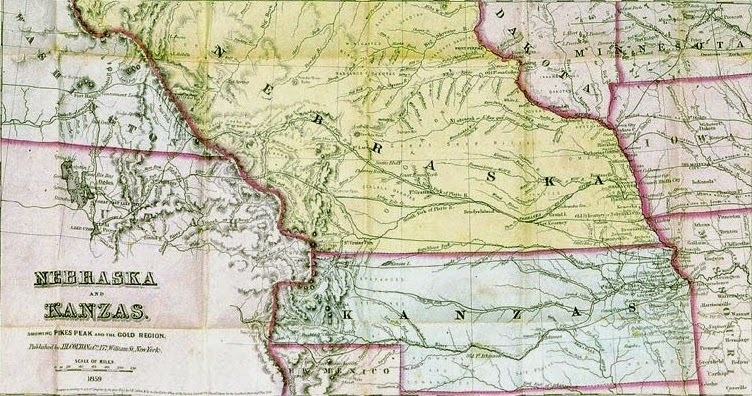 Many maps, such as this one, show the western boundary of Kansas Territory as following the continental divide and including about 2/3 of the present state of Colorado. A number of problems occurred during the late 1850's which determined a change in the western boundary of the territory. The first and foremost concerned the discovery of gold along Cherry Creek and the eastern slopes of the Rockies in 1858. This discovery brought a rush of gold-seekers into the western reaches of the territory. Because of the distance of the gold diggings from the territorial capital at Lecompton (in the eastern part of the territory), important decisions arising from land disputes and legal controversies were often delayed for weeks. It became such a problem that the enforcement of law and order was at times jeopardized. In addition, between the gold fields and civilization lay five hundred miles of unsettled lands populated by a number of Indian tribes that saw the encroachment of whites as a threat to their existence. Realizing that justice could not be administered to the far western reaches of the territory in an effective manner, delegates of the Wyandotte Constitutional Convention chose the 25th Meridian west of Washington as the new western line of the proposed state and the boundary was accepted by Congress. 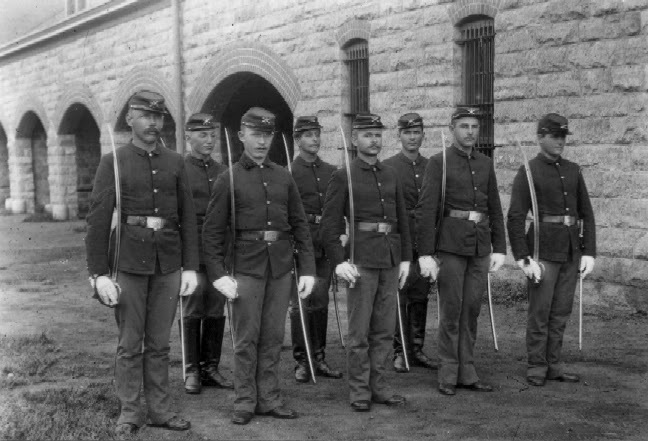 The first definite step toward the settlement of the country soon to become Kansas was the establishment of Fort Riley. In the summer of 1852, Colonel T. T. Fountleroy, former commander of Fort Leavenworth, wrote to the Quartermaster General of the Army recommending the establishment of a new post "at or near a point on the Kansas River where the Republican unites with it." Late that fall, a party of Dragoons traveled to the location and a camp was established on the present site of Fort Riley. It was called "Camp Center" because it was thought to be at the geographical center of the United States. Early in 1853 monies were appropriated for the erection of buildings at the new post and it was renamed to honor Major General Bennet C. Riley, a Mexican War hero, who died that same year. By summer Major E. A. Ogden, who had been appointed to oversee the construction of the post, had begun the first buildings. At the end of the summer of 1854, Major Ogden reported, "The buildings now erected consist of three double blocks for officer’s quarters and four sets of soldier’s barracks." In addition bridges, roads and sawmills had been erected to facilitate the construction. By the ill-fated summer of 1855, several communities had been started near the post and new settlers were arriving daily by boat and wagon train, lured by speculators and their own desire to people the newly created Kansas Territory. In July, cholera erupted at Fort Riley and within a two-day period the post was nearly decimated with almost a hundred deaths, including Major Ogden, and large numbers of desertions among the workers. It was also during this time frame that the boundaries of the post were "expanded" or "established" depending on which historical account one chooses to believe. In short, Major W. R. Montgomery, a southerner and the post commander at the time, extended the post environs to incorporate the new settlement of Pawnee, effectively wiping out the town and its fast growing population of "Free-staters." Also included in this expansion were the prosperous farm claims of the Dixon brothers, James and Thomas, which had earlier been the subject of a "land war" between the brothers and post personnel. This dispute had resulted in the visit from Generals Clark and Churchill who, at the request of President Franklin Pierce, charted boundaries of the post, which excluded the city of Pawnee and the Dixon lands. But Jefferson Davis, then Secretary of War, approved Major Montgomery’s boundary recommendations and the citizens of Pawnee and the Dixon families were forced to relocate. In September of 1854, the Pawnee Town association was formed to establish a town near the new army post at Fort Riley. This association was composed totally of military officers and territorial officials, including Major W. R. Montgomery, the commander of the post, and the first Territorial Governor, Andrew H. Reeder of Pennsylvania. Governor Reeder assured the association of his intent to convene the first Territorial Legislature at Pawnee if proper buildings could be constructed. Major Montgomery agreed to exclude the town site from the first survey of the fort reserve completed in December of 1854. First Territorial Capital prior to renovation. Soon Pawnee was a booming town of a dozen or so dwellings, with a two-story stone capitol building and a large hotel under construction. Two sawmills were operating there and three saloons catered to the workmen and soldiers building the nearby fort. In April of 1855, Governor Reeder called the first legislature to convene at Pawnee on July 2nd. However, the legislators were mostly pro-slavery Missourians, while Reeder and the Pawnee citizens were predominantly Free-staters. 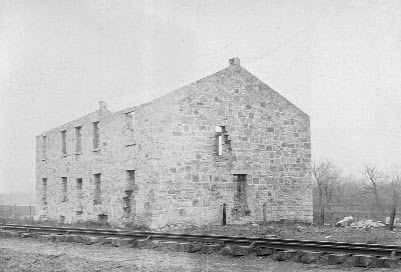 This Bogus Legislature met at Pawnee July 2nd – 6th, 1855 in the unfinished warehouse. The main acts of the session were to expel the two free-state members and to vote to remove the seat of government to Shawnee Mission, a few miles from the Missouri line. Though Governor Reeder vetoed this bill, he had no choice but to join the body when they reconvened in Shawnee Mission on July 16th. Pawnee continued to prosper for a few more weeks and reached a peak population of about 500 that summer. 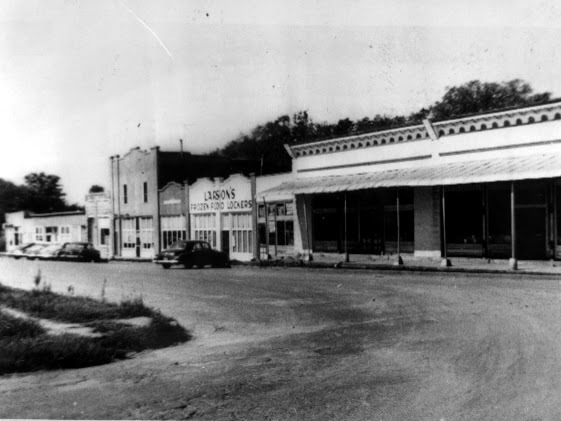 However, the town’s brief life was ended in August of that year when Jefferson Davis expanded Fort Riley to include the settlement and ordered all residents off the site by October 10th. In November, troops used large grappling hooks to tear down all the buildings except the old stone capitol. Most of Pawnee’s citizens moved across the river to Riley City founded in September of 1855, or the Ogden vicinity where Thomas Reynolds had first settled in June of 1854. The “Bogus Legislature” of 1855 created Riley and Davis Counties. Davis County, named for Jefferson Davis, then Secretary of War, was originally defined as “starting at the southwest corner of Richardson (Wabaunsee) County and running west 30 miles, thence north to the Smoky Hill, and down the river to the northwest corner of Richardson.” However, some squabbles erupted over certain sections of the two counties and for the next several years various changes were made in the boundaries. Initially both the communities of Ashland and Ogden were located in Davis County and each, along with Pawnee and Riley City, functioned briefly as the county seat. For a time, both counties were governed as one, but in 1857, the legislature made provision for the organization of Davis County into a separate and distinct corporation. In 1860, an election was held to determine a county seat and Junction City won out over Ashland, Riley City and a small settlement called Union. The Kansas Legislature of 1873 made some changes in the boundary lines of Davis and Riley Counties. Ashland Township was given to Riley County while Milford Township was made a part of Davis County. After the Civil War, the idea of living in a county named after the "traitorous president of the Confederacy" was particularly abhorrent to George W. Martin, the colorful editor of the Junction City UNION. He mounted an unrelenting campaign in print to get Davis County's named changed. This was finally accomplished in February of 1889 when the Kansas Legislature passed a bill changing the name to Geary after General John White Geary, the 3rd Territorial Governor of Kansas and a Union War hero. Up until 1872 there had been only one township in Davis County, but in that year the County Commissioners divided the county into two civil townships to which they gave the names Smoky Hill and Jackson, after Gen. Andrew Jackson. Liberty Township, organized in April of 1875, was formerly part of Jackson Township and is the southeastern most part of the county. Lyon Township, created in 1877, was named for Gen. Nathaniel Lyon, an early settler in the region who was killed in the Civil War. It incorporated the area from the original Smoky Hill Township that was located south of the Smoky Hill River. Jefferson Township, formed in 1878, was originally part of Jackson Township. It was named for Thomas Jefferson and contains the locations of the earliest settlements in the county. Originally it extended the whole north and south length of the county. Sometime between 1886 and 1897 two more townships were created. Blakely Township was carved from the southern half of Jefferson Township and Wingfield Township was formed from the western portion of Jackson Township. Three different communities were planned for the site at the junction of the Smoky Hill and Republican Rivers before the town of Junction City finally took root. The town site was first chosen by three land agents of the Cincinnati – Manhattan Company who arrived here in May of 1855. The proposed community was named Manhattan and one of the agents, John Pipher, was elected mayor. Supplies to build the city, including prefabricated houses, were purchased and sent up stream on the steamboat "Hartford." But this vessel went aground near the site of present – day Manhattan, which was then a freshly established settlement called New Boston. The settlers went ashore and agreed to merge with New Boston if the name were changed to Manhattan. Following this merger, the captain of the "Hartford," a man named Millard, proceeded to the original town site at the fork of the two rivers. He, along with two other men, claimed the town site and renamed it Millard. It seems that the backers of this new city were not too active except in the sale of town lots in the East and Millard existed only as a "paper" town. 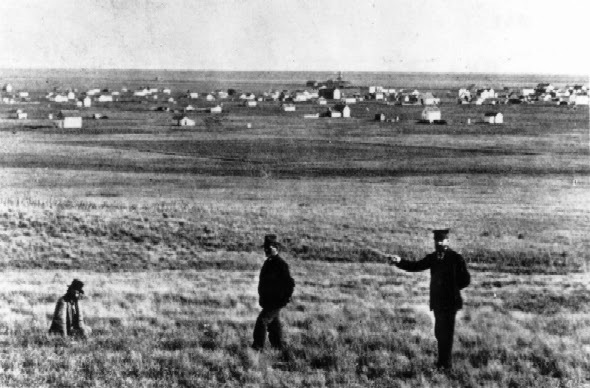 The earliest known photograph of Junction City. Railroad survey engineers about 1861 - 1863. Another town, Humbolt, was then planned for the site by some local farmers a year or so later, but again, no one actually resided in the town. t was in the fall of 1857 that a group of settlers in the area once more made an attempt at establishing a town at the junction of the rivers. This time the name Junction City was given to the site and work was begun on the first buildings in the spring of 1858. 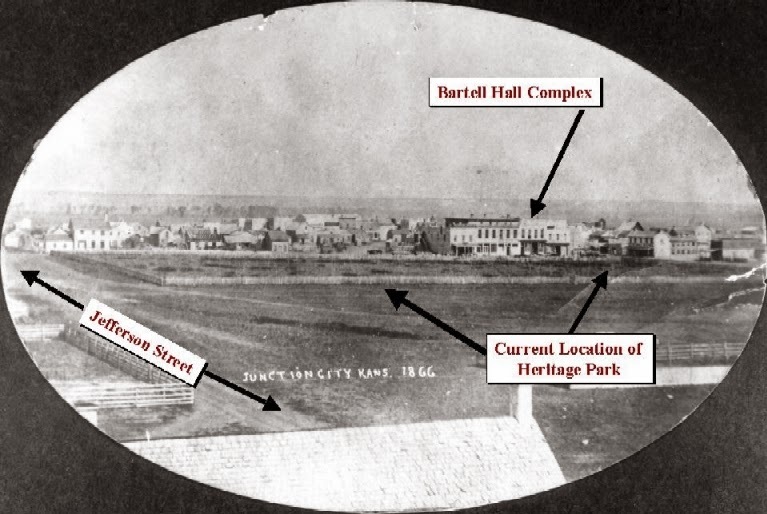 In February 1859, Junction City was incorporated by a special act of the Kansas Legislature and by 1860 it had begun to resemble the busy trading center first envisioned by its founders. The community of Wreford grew up around a railroad siding of the Missouri, Kansas and Texas, or the “Katy,” as it was called locally. Homesteaders and farmers had settled in the area after the Civil War, and in 1870, a regular MKT train began running the 37 miles from Junction City to Council Grove via the Wreford area. H.C. McCarty, a Civil War veteran, had opened a general store in a two-story building set in a grove of trees near the crossroads. The McCarty family lived in the upper story of the store, which also served as the post office and the telephone exchange. McCarthy named the community “Wreford” after his brother who had died in the war. 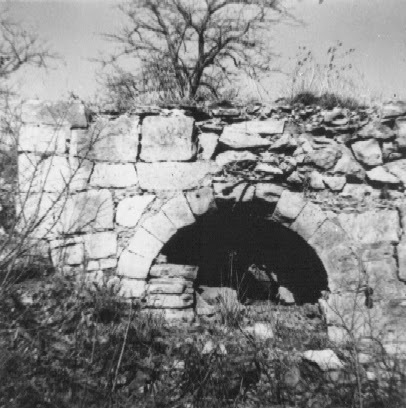 Lime Kilns at Wreford ca. 1950's. As the community developed, a stockyard, grain elevator, weighing scale, icehouse and a small depot were built along the tracks near the store. Farmers brought crops and cattle here to be loaded on the trains for market. The floods of 1903 almost inundated Wreford, but the demise of the railroad was the death blow for this Geary County community which achieved its peak population during the World War I years. In the late 1920’s, the depot was closed. This meant that those who wanted to ride the train had to get in the middle of the track and flag it down. The mailbag was thrown off to the side of the track as the train passed through. In the 1950’s, a move to close the stockyards involved a midnight change of the community’s name from Wreford to Brant, but this designation was most unpopular and very short – lived. Eventually the McCarty’s store closed and was torn down, and today, the Dickson Blacksmith Shop is all that is standing of the Wreford business district. Alida was located in the Smoky Hill Township at the point where Curtis Creek joins the Republican River. The area’s first settlers claimed land in 1858, but it was after the Civil War before the community really began to take shape. Mrs. Royal Clemons, wife of the first postmaster, named Alida. They had come to the area from New York in 1868. When the post office was established in 1870, it was located on, or in, Mrs. Clemons’ chest of drawers. Because of this, she was allowed to choose a name for the little town, and in a spell of homesickness, she selected "Alida," the name of one of her girlhood chums back in New York. Alida R.R. Station ca. 1950's. 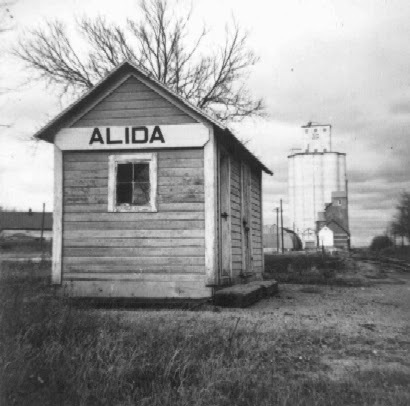 The grain elevators that existed in the community of Alida were its landmark. Eventually however, they and the town were demolished to make way for Milford Lake. The original town of Milford or Bachelder was the oldest community on the Republican River. The earliest settlers to arrive in the vicinity were three members of Governor Reeder’s party of Pennsylvania free-staters: Abraham Barry, Marshall Barry (his 14-year-old nephew), and George Taylor. In the spring of 1855, these men staked land claims near the mouth of Madison Creek. About the same time, John and Lucinda Badger established a home six miles to the south, along the Republican River. During the next two years more settlers and families scattered along the river and its tributaries. By 1857, the Bachelder Town Company had organized and the town of Bachelder was incorporated by act of the Territorial Legislature in 1858. Ten years later, in 1868, this community was renamed "Milford" at the urgent request of the town postmaster who was annoyed at the continual misspelling of the name "Bachelder." In 1961, the citizens of Milford voted to relocate the community to accommodate the scheduled construction of Milford Dam. In 1965, the original town site of Milford was bulldozed and now lies under the waters of Milford Lake.